My closet may usually look like an explosion hit it, but you can’t blame Erica and Zack Kauffman, the super cool owners/designers of Atomic Cotton! Their awesome horror themed t-shirts make even the sloppiest terror fan look like they are headed to some truly exclusive terror themed prom night. The femme beast in me, also, loves that one of their recent designs is a beautiful reenactment of The Craft (as seen above). 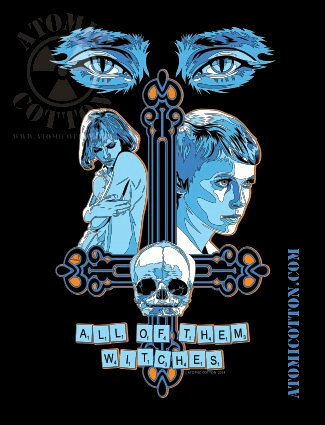 Their glorious homage to Mia Farrow and Rosemary’s Baby is, also, a worthy present for any future Black Mass christenings that you might be attending. Be sure to peruse all of their spine tingling product at http://www.atomicotton.com and https://www.facebook.com/AtomiCotton.